During the last 8 years, some fishers that we now represent Pesca ABC began to collaborate with government and non-governmental organizations in the design and evaluation of other fishing gear to offer more options to the fisheries sector of San Felipe. Some of these efforts have been documented by our partners and are a sample of our work. Since 2008, we started working with Inapesca in the development and testing of the RS-INP-MX (acronym in Spanish for Selective Net of the National Institute of Fisheries of Mexico) selective net. 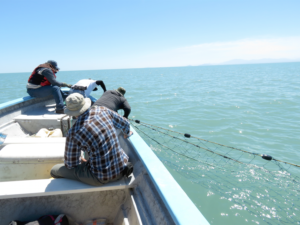 This net will enable us to catch shrimp without affecting the vaquita. In the summer of 2012, Inapesca and the Southeast Fisheries Science Center of the US government conducted joint tests to determine the efficiency of the selective net. At the time, tests were conducted with the help of experts from both institutions and fishers from Pesca ABC, catching an average of 38 kilograms of shrimp per trip. View full document. Along with the use of the selective net, Pesca ABC works with government agencies and non-governmental organizations in the design and evaluation of other fishing gear to offer more options to the fisheries sector of San Felipe. In 2012, Inapesca carried out a scientific cruise on board of UNICAP XVI fishing research vessel, in which 8 different fishing gears were tested. Findings show that the most promising fishing alternatives for the Upper Gulf of California are trawling fishing systems, longlines and pods. See Inapesca report. In 2013, fishers from Pesca ABC worked with Pronatura Noroeste in assessing longlines as an alternative to fishing in the Upper Gulf, finding that the use of this type of gear is profitable for the region. View Pronatura report. Between 2015 and 2016, fishers from Pesca ABC participated in the evaluation of fish pods, finding that the pods can be an efficient system for the Upper Gulf of California, but modifications are still required to increase profitability. View the report. In 2016, at Pesca ABC we researched on what other countries are using and traveled to North Carolina, in the United States, to analyze the viability of stow nets. Fishing technicians from the Mexican and United States governments coordinated the journey. Results are very promising for the Upper Gulf. See report.